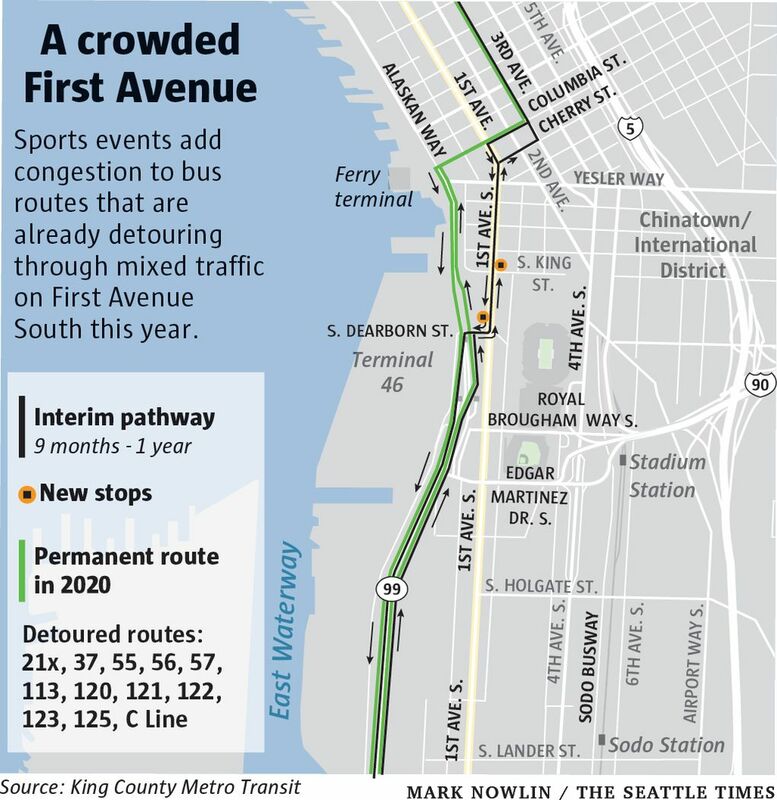 The next play in the five-year Seattle Squeeze will begin Thursday, when Mariners fans join the major-league congestion on First Avenue South. “I’m legitimately petrified for baseball season. 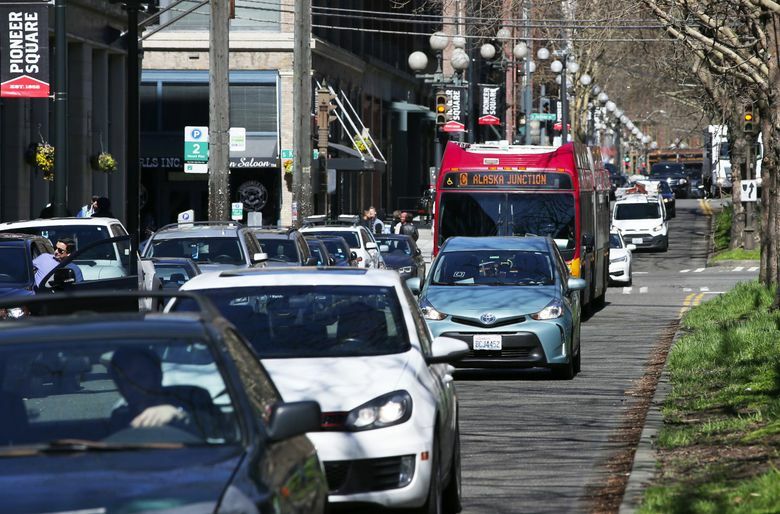 I don’t feel like they’ve got a good handle on First Avenue traffic right now,” said Colleen Harris, who commutes on the C Line bus to West Seattle. The Seattle Mariners’ home opener is 4:10 p.m. Thursday against the Boston Red Sox, the first of six home games in six days. King County Metro Transit and the Seattle Department of Transportation (SDOT) intend to keep the dozen Highway 99 routes going through the First Avenue detour. Viaduct removal was a “total game changer” that confounds any predictions about gameday traffic downtown, said Bill Bryant, Metro’s director of service development. 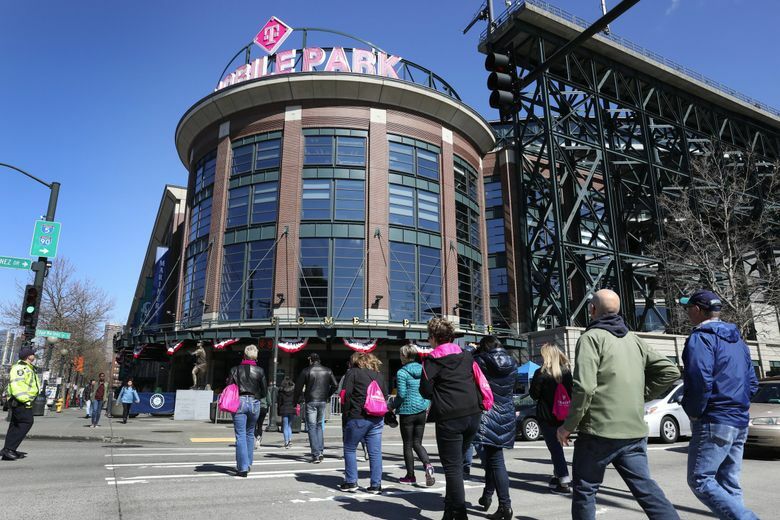 Sporting events will also obstruct southbound drivers who emerge from the tunnel and try to reach Interstate 90 and Interstate 5 using the Edgar Martinez Drive overpass. Traffic-control plans for the Mariners and Sounders FC call for police to block the overpass postgame, to help pedestrians and to clear out local and parking-garage vehicles. Drivers who exit the tunnel nearby will have to go elsewhere, such as a right turn on southbound First toward Spokane Street. Mayor Jenny Durkan said extra police and signal-timing changes can help on baseball-game days. “Big events are nothing new, and they’re nothing new for big cities anywhere in America,” she said. When there’s a game during rush hour, that’s the time to stay downtown, have dinner and not be in a hurry to go home, she said. “There will be trial and error, and we don’t want anyone to think this is going to go without problems,” she said. After five weeks, the bus pathway on First has been passable, though fickle. Metro says trips average 15 minutes from Columbia Street downtown to Avalon Way entering West Seattle between 3 and 7 p.m. — three minutes slower than former viaduct trips. “Overall, we’re fairly pleased at the way it’s been operating and looking for room for improvement,” Bryant said. But averages obscure the slowdowns and hassles at the peak of the commute, when buses routinely miss green lights because of full lanes ahead. “At 5 p.m., it’s an extra 10 or 15 minutes at least, to get to West Seattle,” said Harris, a business-analytics specialist. She began logging trips. The first six averaged 52 minutes from Seneca Street in downtown to Findlay Street south of Alaska Junction. Trip times cool off by 6:30 p.m., typically 25 to 30 minutes from downtown to West Seattle. Likewise, a routine morning trip at 8:20 a.m. takes a half-hour inbound. In addition to the baseball opener, this week 830 buses a day were evicted from the downtown transit tunnel, to make room for a convention-center expansion. Tunnel buses aren’t moving to First, but there might be ripple effects from the downtown congestion. Bryant said tolling of the tunnel midyear will affect transit reliability, when some drivers divert to surface streets rather than pay tolls. Buses can move to waterfront Alaskan Way at year’s end, with viaduct demolition no longer blocking lanes there, but dedicated bus lanes won’t be ready for another year, Bryant said. Why not stripe bus-only lanes on First? Besides bollixing general traffic, a succession of 42,000-pound buses in the outer lanes would damage the walls that support hollow areaways below the sidewalks, a SDOT engineering analysis concluded. Areaways were created after the Great Seattle Fire of 1889, when city leaders chose to rebuild streets in Pioneer Square several feet higher. The gaps below sidewalks draw visitors to Underground Seattle tours. To protect areaways, the buses stay in the interior lanes. However, riders asked Metro for a Pioneer Square stop, as did City Councilmember Lisa Herbold, who represents West Seattle. In response, the city found the two sites that don’t have areaways. First Avenue bus stops opened last weekend northbound at South King Street and southbound at South Dearborn Street. 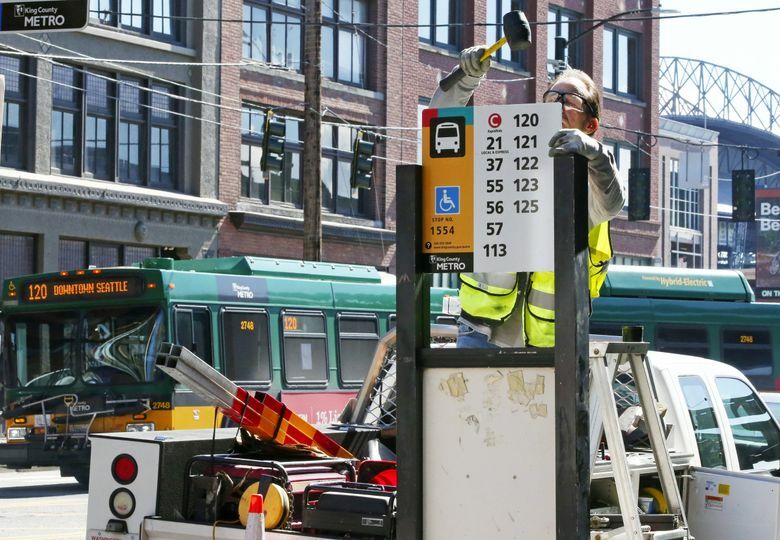 Those give commuters a new option to get off the bus in Pioneer Square instead of at Third and Seneca Street, and might become convenient for sports fans. Why not send transit through the Sodo Busway? West Seattle-area transit riders appreciate the smooth 27-minute trips in January during the Highway 99 closure. But that route was mornings only, required traffic police and a temporary bus lane aggravated traffic delays on Spokane Street. Buses zipped north in the Sodo Busway, a transit-only street that runs parallel to light-rail tracks. To take the buses southbound, Highway 99 routes would need to ford the chokepoint around Fourth Avenue South at King Street Station, which clogs on game days. The Mariners organization isn’t freaking out. “We’ve been in a constant state of disruption here, for a long time, with ongoing construction,” spokeswoman Rebecca Hale said. With an assist from Sound Transit light rail, ballgames attracted only 298 vehicles per 1,000 fans last year, she said. On the other hand, most fans live outside King County, so driving is often the only realistic mode. “One of the things about sports fans is, they will find a way,” Hale said. But unless transportation agencies also find a better way, Harris said her best option to leave downtown on game nights would be renting a Car2Go.